Labels We Love: Coppertail Brewing Co.
Free Dive: An IPA that’s available year-round, not just in Tampa and St. Pete, but also in Miami now too. Unholy: This is an American-version of the Belgian Trippel. Brewmaster Casey Hughes cut his teeth brewing Belgian beers at Flying Fish in New Jersey. By all accounts, he nails it with Unholy. Night Swim: I can’t imagine drinking a porter in South Florida’s heat, but what do I know. This one’s rich with some chocolate. Also, pretty sure that’s a mermaid couple on the label. Smoking a pipe. Wheat Stroke: An easy-drinking wheat ale (now we’re talking South Florida!). I feel like there are some inside jokes going on in some of these labels. Captain Jack’s Stone Crab Stout: Hunting for stone crabs is a thing in Tampa. So’s drinking this beer in the winter. Brew’s Banner: A double IPA. This is the label that turned me onto Coppertail. And it’s a little different than the rest of the artwork. Not as dark and also, where’s the coppertail? Oktoberfest: I want to go to this Oktoberfest party. The one with farmer/pigs and an octopus. Cryptid: You can get this imperial stout (12%!!) in November. So many tentacles, I’m not sure where one begins and another begins. That’s hot. Seasonal Relief: Because you need a little help through the holidays. This Baltic Porter is here for you. Even the barrels they age their Unholy trippel in are badass! Okay, pretend you’re a young brewery that wants to carve out some space in an already crowded craft beer market. What do you do? You make great beer and you put a wicked cool label on it so people will pick up your bottles. That’s brewing 101; Write that down. South Florida’s Coppertail Brewing followed that plan to a “T,” hitting Tampa and St. Pete with solid IPAs, Trippels and porters and wrapping them in whimsical, kind-of steam punk, inspired art. 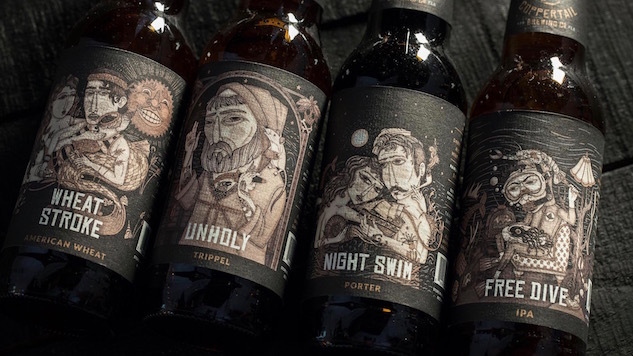 Portland-based artist Evan B. Harris created the original artwork for the labels, which Coppertail wanted to be “fun, but with a dark side.” You’ll find a water theme in most of the labels and the ubiquitous “coppertail” that gives the brewery its name. So what the hell is a “coppertail”? According to the brewery, it’s a sea monster that lives in Tampa Bay—the strange and fantastic that lurches beneath the surface. Fun, but kind of dark. Just like the labels. Take a look at the gallery and see for yourself.